Gary is a senior executive with over 25 years’ accounting and finance experience with an emphasis on early-stage and venture-backed high growth technology start-ups. He has extensive experience as a member of management teams, collaborating with Board members and working directly with CEOs. After beginning his career in public accounting at Ernst & Young, Gary worked in the manufacturing industry for a few years before transitioning into technology. He was a key player in the growth of many local tech companies, actively involved in securing working capital debit facilities, negotiating lines of credit, overseeing and completing investor due diligence. Prior to joining CFO Selections, Gary was the VP Finance at Array Health Solutions where he was a member of the Executive Leadership Team and had frequent participation with the company’s Board members on various strategic initiatives. He was responsible for all accounting, risk management, and legal functions, as well as managing human resources, recruiting, and facilities teams. 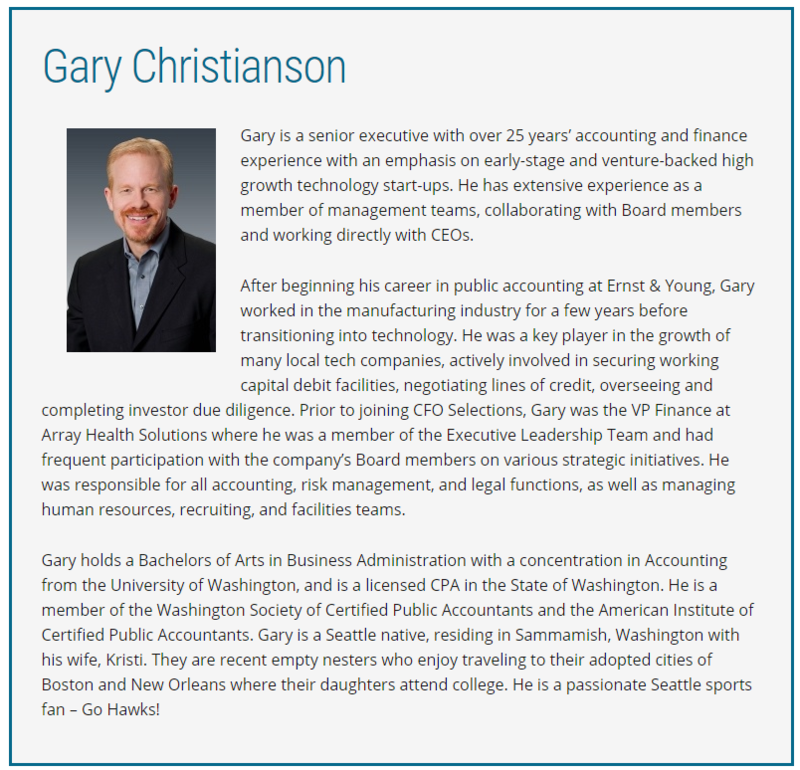 Gary holds a Bachelors of Arts in Business Administration with a concentration in Accounting from the University of Washington, and is a licensed CPA in the State of Washington. He is a member of the Washington Society of Certified Public Accountants and the American Institute of Certified Public Accountants. Gary is a Seattle native, residing in Sammamish, Washington with his wife, Kristi. They are recent empty nesters who enjoy traveling to their adopted cities of Boston and New Orleans where their daughters attend college. He is a passionate Seattle sports fan – Go Hawks!